Way back in the days when video games in general were often referred to as 'Nintendo' games, a little gem called Tetris was packaged-in with the Game Boy, and it helped catapult the handheld to dominating heights. 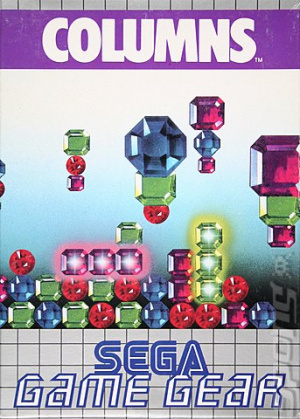 A couple of years later SEGA released the Game Gear, and in what can only be seen as an attempt to capitalize on the same success as Nintendo, it bundled in a falling-block game called Columns. 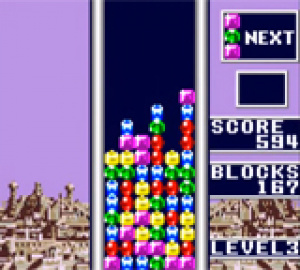 Now over 20 years later, SEGA’s answer to Tetris has surfaced in the 3DS eShop, but the question is – are these columns strong enough to support a purchase? Here, columns comprised of three jewels – of varying colors – descend from the top of the screen one at a time. The goal is to stack these columns to align three or more jewels of the same colour, which will clear up space and earn points – they can be matched horizontally, vertically, and even diagonally. As you progress, things begin to speed up, and if your stack reaches the top of the screen, it’s game over. Sound familiar? It mostly is. 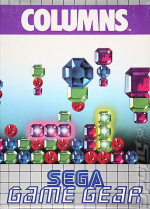 Controls are simple; move the falling columns from left to right, while the A-button will reorder the jewels within them. Despite the necessary strategy and skill that’s required to set high scores, that’s about the extent of the gameplay mechanics. This accessibility is the beauty of a puzzler like this, as it’s immediately understandable gamers of all levels, yet still cerebral and rewarding enough for veterans to master. The game is broken up into two main modes; Original and Flash. An Original match is a straightforward affair that will have you surviving as long as you can while attempting to set a high score. It’s all very traditional, extremely effective, and nearly impossible to play only once. In Flash, you’ll have to clear away a flashing block at the bottom of a pre-existing pile to win the match. When selecting either of these modes, you’ll have the option to select difficulty, song, level (which is basically falling speed), and even how you’d like the pieces to look – shaped like fruit, suits of playing cards, dice, or standard blocks. Those who like the thrill of local head-to-head gaming will be happy to know that there’s the option for a two player versus match, though it requires each person to have a copy of the software. 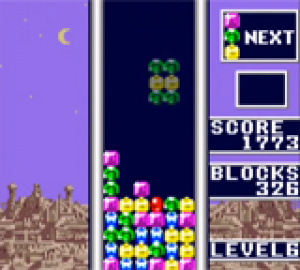 You can play the same modes available in single player, but for the sake of shaking things up, clearing a combination of jewels or columns will add blocks to the opponents screen, leading to many tense and exciting moments. We recommend that you definitely take advantage of this multiplayer feature if you have the opportunity. If there’s one major downfall of Columns, it’s that things often get unmanageable too quickly. In a game like Tetris, where you need to fit shapes into openings, it can almost be done reactively and with your peripheral vision, but here, lining up colours requires greater thought and planning. When the action begins moving at a blistering pace, it’s nearly impossible to place columns where you’d like them to go. The game would have assuredly played much better had things escalated a bit more gradually. As far as the audio goes, it’s a mixed bag of mediocre and, well, slightly above mediocre. The sound effects are a bit sparse and lack a sense of purpose, and while none of the music is particularly memorable, it’s not terrible, either. Additionally, aspects of the visual presentation – like the boring grey and blue backgrounds – are rather drab, though that may have been intentional to keep the focus on the vibrant coloured game pieces. Luckily none of this affects gameplay, though it is noticeable. If you’re looking for a solid puzzle game to help kill 20 minutes here and there, or if you’re addicted to setting high scores, definitely give Columns a look. There isn’t much variety, or depth, but there’s healthy amount of fun for a reasonable price. Anyone looking for something unique, or with a sense of progression, should move on – these aren’t the jewels you’re looking for. In a lot of ways Columns is certainly similar to Tetris, but in the same breath, it has just enough variation to feel like its own experience. The gameplay functions mostly without hindrance, and like many puzzlers it possesses that “one more time” style of action. While there are some shortcomings in the form of mediocre sound, bland visual presentation, and an overwhelming spike in difficulty, these things don’t make Columns any less addicting to play. Tetris this is not, but it’s still a fun game, regardless. Pass. I will get Dr Robotnik instead and it has more stuff to do. I played Columns on my Dreamcast the game was part of a Sega Collection for the DC. The game was nice but two modes I got bored quickly. If it came with Super Hang On and World Cup '90 I'd get it. I have this game in cart form on my Genesis and Game Gear. Bought the 3DS VC version, haven't played Columns in years, and I manage to make it to level 8. Not half bad in my opinion. So VC games can do multiplayer. Damnit Nintendo, stop being lazy! Release pokemon already!! I have this on cart for the Game Gear and it is one of my favorite games on the system very fun and plays great I really want to check out Super Columns. @Retro_on_theGo: Super C on the 3DS VC has download play so you can do multiplayer on that. @DRL: Great review looks like I will be picking this one up soon. Great review Dave. And I agree with this: "If there’s one major downfall of Columns, it’s that things often get unmanageable too quickly." 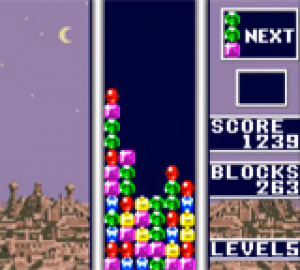 The Tetris ramp-up seems more gradual and fair, allowing for longer play sessions. Here I feel like I only get a few minutes before a switch flips and it's suddenly luck based. Not a huge complaint, it's still a fun game, but certainly noticeable and I'm glad you brought that up. Interesting. After I see the Dr Robotnik game review, I'll make my decision on which GG game to get. A small hint, the game is actually easier on the harder difficulty. Enjoyed it on the Genesis, but all of the screenshots of the GG version make it look blurry as all get out. Is the game really that bad looking? @Philip_J_Reed @Tasuki - Thank you, sirs! Yup, good review. I have multiple Genesis versions, so I won't be playing this one, but I still think it's a good puzzler to have on the go. I got this last night and it's pretty fun but yes, it ramps up in speed far too quickly for my liking, but I seem to keep getting better the more I play. I made it to level 9. The random blocks (suits, dice, etc) look so cute, I think. I can't decide what is my favourite. Is the difficulty spike similar to the Genesis version? I would have to say I prefer this over bean machine but not 100% sure. I don't think there's really a difficulty spike. On easy, you can basically just mindlessly fill up columns and count on things to clear by chance, so the speed barely matters, but even with more colours, there's time to shift after touching the stack, so even though the speed looks fast, it's still quite playable, especially if you're consistently clearing stuff to buy yourself extra time and take advantage of the piece preview to plan ahead. The Mega Drive and GG/SMS versions play very simiar and the dificulty is pretty similar, all the gameplay modes are fully accounted for (not that there are that many) so not much difference. However, one reason i still love the Megadrive/Genesis version is the audio. OK so the GG and SMS sound chip are much weaker than the MD, but the GG and SMS versions just don't sound that good. The tunes in the Megadrive version are some of my favourite on the system and change organically (it's more complex than just speeding up as you get higher up the screen) throughout the game, a very clever arrangement. I've got Columns on the Megadrive collection (PS2), i was dissapointed with that version because the music spools from the CD and doesn't react at all to the gameplay. Oh yeah, and good review. Wholly agree with the summing up. No tetris beater but still addicitive and fun. I believe this was the only game I ever played on an actual Game Gear, borrowed from a friend. I loved it then and was jealous of its color, backlit display (though not about to give up my Game Boy or its economical use of batteries!). Definitely downloading this one soon. @Ralizah I didn't notice any blur when I was playing the game, and I was playing on an XL. I played this game to death on the Game Gear. Really addictive and I honestly think it was as good if not better than Tetris. 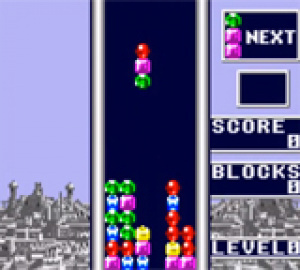 Tetris came first, yes, and inspired so many other games including this one, but it was great.